The Trident HG3 speakers were first announced at the '09 AES. Since then many audio pros have been waiting anxiously for these speakers to hit the market. I've heard through the grapevine that they will be released shortly. Maximum Output: Mid/High Section - 80 Watts RMS. Brainworx -Make $30 in 2 minutes! 30$ voucher for your opinion! + WIN A FREE BX_ALL BUNDLE! We have setup a small and easy user survey to get to know you better. PLEASE CHECK THE SURVEY HERE & WIN A 1,000$ BUNDLE! >>> We´ll give you a personal 30$ voucher via email to say THANK YOU for your help! Voucher can be combined with offers and can be used multiple times! Your voucher is valid until August 30, 2011! bx_shredspread TDM out now: it´s a FREE upgrade!! 25% off in June! Just 109 US$ / 75 EUR! VIDEO & INFO ... bx_shredspread TDM out now! If you own bx_shredspread, just grab the new V1.1 installer and rock on in TDM land! This Summer, IK Celebrates its 15th Year Anniversary! Once in a lifetime MEGA Group Buy! Buy any qualifying IK product* and get another one FREE of equal or lesser value. But that's not all! When 5,000 users participate you get TWO FREE Products! Check out our Group Buy page now to see where it stands, what the eligible products are and all other information. * T-RackS 3 Singles, AmpliTube Custom Shop Gear Credits, 3rd party software products, books, merchandising, iPhone/iPod touch/iPad accessories and apps excluded. Free products can only be downloadable software - not shippable products. 15% discount on the entire IK range! From June 15 to September 15, 2011 only, use the promo code 15YEARS at checkout to take 15% off everything in the IK's online shop. You can even apply this promo code** to your Group Buy purchase for additional savings! This of course excludes iOS apps since those are only available in the App Store. JamPoints are like dollar/euro that IK users earn with every purchase to redeem as a discount** on your future purchases. During our 15 Year Anniversary Celebration, registered IK users will receive a minimum of 15 FREE JamPoints, which they can use at the IK online shop. If you are not an IK user yet, simply download and register AmpliTube 3 Custom Shop FREE, SampleTank FREEor any of IK's FREE iTunes apps during this celebration and you will receive 15 JamPoints in your User Area. **One promotional code per order. IK registered users, you'll have a chance to win a Fender guitar, Pro Tools 9, Yamaha MOX6 and many others for this Summer's Celebration. Check out thefull prize list! All IK registered users are automatically entered for the giveaway. If you are not yet an IK registered user, simply download and register AmpliTube 3 Custom Shop FREE, SampleTank FREE or any of our FREE iTunes apps to join. During the celebration we will announce some surprise promotions, so stay tuned to our web site, forums, Facebook, Twitter, YouTube and SoundCloudsocial networks for more to come during the IK Multimedia 15 Year Anniversary - Celebrating 15 Years of Musical Innovation. Gobbler is a new service that will become an asset to many audio and video pros. It is compatible with all the major DAWs. Mac OSX only at the moment but Windows support is on the way. They're currently offering a free 50gb account for signing up before June 27. 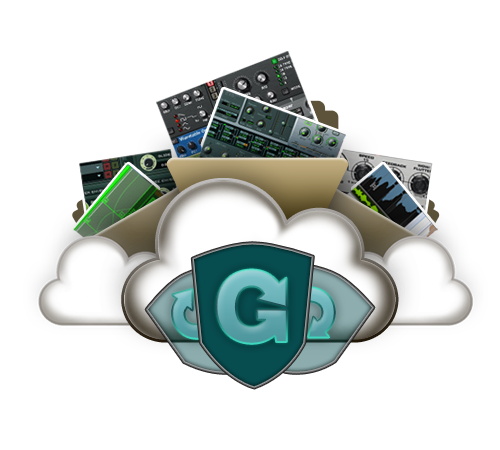 "Gobbler is the backup, transfer, and organizational tool for managing audio project files and assets. Gobbler solves some of the most frustrating problems that musicians and producers face on a daily basis, without getting in your way or changing the way you work. We integrate with most major DAWs to help you keep your files secure, expedite the process of sending and receiving, and provide access to them from anywhere with an internet connection. With Gobbler, you’ll never lose a project again. It’s extremely powerful, but simple to use." Your recordings are irreplaceable. So is our backup built for audio. File changes are monitored in real-time and automatically backed up. Un-delete old projects and restore previous file versions through historical snapshots. Drives can be disconnected during backup, and when reconnected will continue backup where it left off. Drives can be moved between different machines and backup will continue from where it left off. Gobbler avoids interference with recording by pausing during any CPU-intensive tasks. Snooze and restart Gobbler to free up bandwidth, and backup picks up where it left off. Deduplication avoids redundant backups, eliminating space taken up by duplicate files. common in multiple versions of a project. Proprietary lossless compression backs files up to the cloud rapidly. Lossless Compression. Send and receive GBs of data fast. Proprietary lossless compression is optimized for audio and speeds transfers by up to 60% from generic file transfer services. Gobbler de-dupes all files in the cloud and makes sending entire projects back & forth fast and easy. File transfer only sends & receives changes, deeply decreasing transfer times. Send projects & files of any size, to any number of recipients. Zipping files is not required to speed uploads to Gobbler. Gobbler maintains master file quality and integrity throughout transfer. Send files to anyone, not just other Gobbler users. One view of all your audio. Never lose track of files. Scan all drives and Gobbler catalogs the locations of all your audio. Easily search and browse your catalog, including offline projects, to locate file whereabouts. Files on disconnected hard drives are still tracked when unplugged. Catalog automatically updates whenever changes are detected. Geo-location records the last known location of any scanned project. Tagging is available to further customize organization of your work. Catalog is accessible via secure login on any computer that has Gobbler installed. Integrated Souncloud API allows users to create sets, organize & upload their bounces. Gobbler takes your security and privacy very seriously. All transmission of file data and metadata occurs over an encrypted channel. Files stored on the cloud server are 256-bit AES encrypted. No users can access your files unless you choose to share with them. Gobbler uses Amazon S3, your data is distributed over several large-scale data centers. Amazon uses military grade perimeter control berms, video surveillance, and professional security staff to keep their data centers physically secure. Amazon S3 provides protection against network security interference such as packet sniffing, Distributed Denial of Service (DDoS) attacks and Man in the Middle (MITM) attacks.